Sarah Van Beckum was born in Hartford, Wisconsin in 1954. She was educated at the University of Wisconsin (Madison), as well as the Sorbonne in Paris and La Ibero Americano in Mexico. 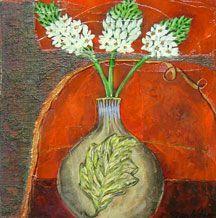 Sarah’s heavy palette knife technique and exaggerated botanicals and still life images create a very distinctive, “artsy” style. Her work has evolved from mixed media using found objects to acrylic on wood panels, often adding collage accents for patterns and texture. Her work can be found in galleries in the United States and Europe.